Arkansas boasts a mild four-season climate, diverse terrain and unparalleled beauty, making it the ideal destination for year-round mountain biking for riders of all skill levels. The Womble — Less than an hour’s drive from Hot Springs, this 39-mile singletrack trail rolls east-west along an Arkansas mountain ridge, following the course of the Ouachita River. The trail provides remarkable scenery, winding through the thick hardwoods and dark pines of the Ouachita National Forest, opening occasionally to spectacular bluffs above the river. Lake Ouachita Vista Trail — The Lake Ouachita Vista Trail, also known as the LOViT, is a well-designed trail on 90 percent singletrack through an old-growth, mixed-species forest. It offers riders multiple challenges and rewards as it explores deep valleys, five different mountains and multiple streams and creeks. Two of these streams utilize innovative, large-boulder crossings that offer a technical challenge for riders. Upper Buffalo Headwaters — The Upper Buffalo Headwaters mountain bike trail offers about 40 miles of singletrack surrounding the highest point in the Ozark Mountains. This gem of riding laces around the headwaters of the Buffalo National River on a mixture of narrow, hand-built singletrack and machine-cut flow trails. The ride is extremely remote and offers stunning scenery past steep cliffs, turquoise waterfalls, abundant wildlife and old-growth hardwood forests. Syllamo Trail — Nestled in the Sylamore District of the Ozark National Forest, the Syllamo Trail is one the finest purpose-built mountain bike trail systems in the country. Arranged in four intertwined loops, the 50 miles of trail provide options for an all-day EPIC or for shorter tours. Ouachita National Recreation Trail — Located on the western border of the state, this long-distance route explores remote sections of the Ouachita Mountains. The recreational trail offers more than 108 miles, making it the longest mountain biking trail in the state. Riders can expect rugged trail surfaces and some hike-a-bike, but also rideable climbs and rowdy downhill sections. The trail connects with the Womble Trail, another IMBA EPIC in Montgomery County — stringing them together for a mega-epic ride! In addition to these five EPIC rides, Arkansas has numerous mountain biking trails across the state for all skill levels, offering something for everyone to explore — from leisurely rides with stunning scenery to exhilarating workouts. One great example is the Northwoods Trail System, a new trail located a few minutes from downtown Hot Springs. Opened recently to the public, the 14.5-mile trail is already receiving praise from riders on its challenging, well-designed course. Carved through a dense forest of towering pine trees, the trail features hand-cut singletrack as well as machine-built flow and jump trails, which allows for a variety of experiences for riders of all skillsets. Check out this video to learn more about how the Northwoods Trails were built. 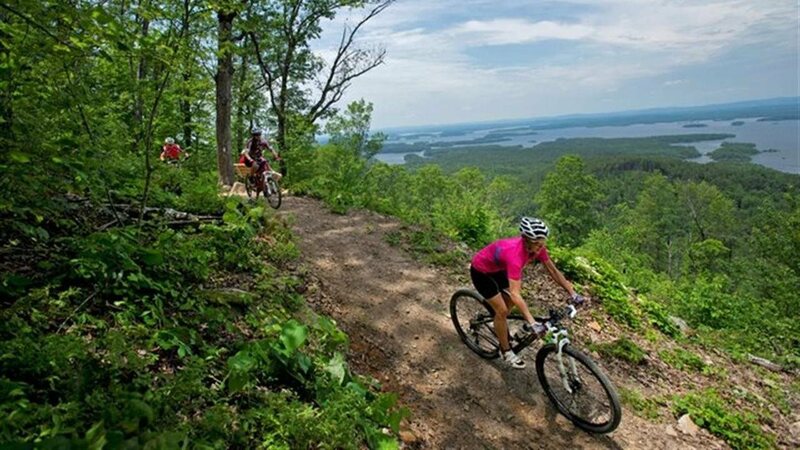 To learn more about mountain biking and other outdoor adventures in The Natural State, visit Arkansas.com.